Award winning writer-filmmaker Wendy Dent, World Economic Forum Young Global Leader 2013 and University of Southern California School of Cinematic Arts Visiting Scholar (2012-2013) premieres her film ‘December 25’ at the Palm Springs International ShortFest, after taking part in the World Economic Forum of East Asia and the World Economic Forum of the Middle East and North Africa. The context of the film is Christmas. But it’s about much more than that. Award winning Australian writer-filmmaker Wendy Dent, World Economic Forum Young Global Leader 2013-2018 and University of Southern California School of Cinematic Arts Visiting Scholar 2012-2013 premiered her new film 'December 25' on June 22 at Palm Springs International ShortFest. The full house audience of over 500 at the film's North American premiere vigorously applauded both the film and the director's attendance. She returned to California for the prestigious film festival, directly from her attendance at the World Economic Forum of the Middle East and North Africa at the Dead Sea in Jordan, the Young Global Leaders Annual Summit and the World Economic Forum of East Asia in Myanmar, and the Sydney Film Festival premiere of her film. 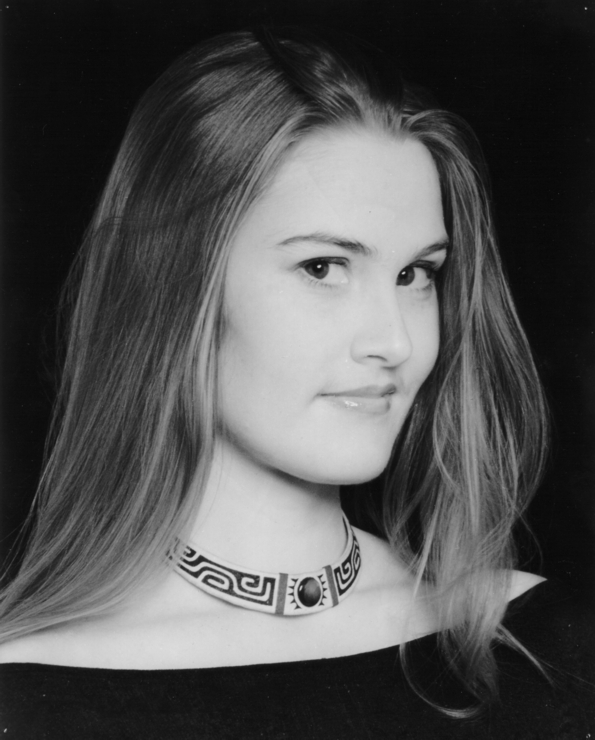 Drawn from a highly competitive pool of several thousand candidates nominated from around the globe, Wendy Dent is one of 199 Young Global Leaders (YGLs) chosen as the class of 2013 by a committee chaired by H.M. Queen Rania Al Abdullah of the Hashemite Kingdom of Jordan. The selection was based on the proven track record of her leadership experience, record of professional accomplishments, ability to overcome adversity and commitment to society. Wendy Dent is joined by William James Adams (aka Will.I.Am) as the selected Los Angeles-based honorees. She is included in the US Young Global Leaders class of 2013 list together with the country's highest achievers, such as Chelsea Clinton, Randi Zuckerberg, and Facebook co-founder Chris Hughes. As a 2013 World Economic Forum Young Global Leader, Dent is given a five year term to participate in the World Economic Forums. She has begun her term by joining the Young Global Leaders' FutureDev Summit in Washington in March. She then participated in last month's World Economic Forum of the Middle East and North Africa at the Dead Sea in Jordan, where she met Queen Rania Al Abdullah in the Queen's private meeting with the Young Global Leaders in attendance. Dent then took part in this month's Young Global Leaders' Annual Summit and the World Economic Forum of East Asia in Myanmar, where together with her fellow Young Global Leaders she met with Aung San Suu Kyi, just after Suu Kyi's announcement of her wish to run for presidency. Directly after attending the World Economic Forum of East Asia, Wendy Dent then returned to Australia after nearly two years of travel, to attend the Australian premiere of her new film 'December 25' at Sydney Film Festival. Well over 500 people attended the 'December 25' Sydney Film Festival premiere. As the credits rolled, gasps of "ooh!" and "wow" rolled through the audience, and an exclamation of "Brilliant!" was heard throughout the theater. Dent's film ‘December 25’, premiered on November 15 to critical and audience acclaim at the prestigious International Documentary Film-Festival Amsterdam (IDFA), the world’s largest festival for documentaries. It was one of just 15 films from around the globe selected for IDFA’s special 25th anniversary ‘One Minutes’ program of one-minute films on the theme 25. The synopsis for the one minute film is fittingly brief- ‘a Christmas message speaks louder than words’, but beyond that the director remains tight-lipped on the topic. “The context of the film is Christmas. But it’s about much more than that,” Wendy Dent says, hinting that ‘December 25’ is a human rights film, for which her work is known. Next week Dent will fly to New York and Washington D.C., for meetings about further projects. 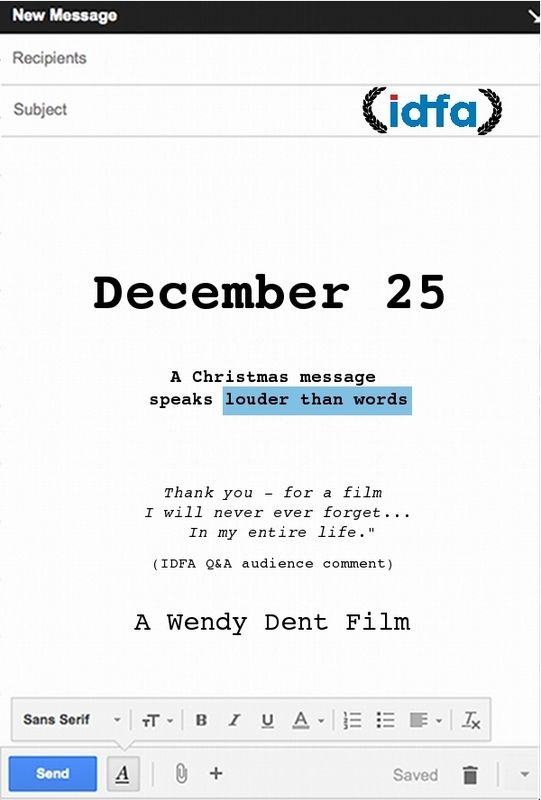 Further information about Wendy Dent and her film 'December 25' can be found at http://www.wendydent.com and http://www.humanrightsonfilm.com.